Dgen inks are fully compliant with REACH regulations (eco-friendly) and produce vivid colours with reliable ink fastness. The combination of Dgen large format printers and inks provide superb run-ability with a stable working environment without print nozzle clogging or maintenance issues. With its printing width of 3.3m and latest RICOH GEN4L print head specially for the textile printing industry, the Dgen Teleios G5 Grande digital textile printer is the latest and the most advanced direct to fabric printer till date. It provides high resolution of 600dpi with true grey scale and along with its high speed heat-fixation unit HeatMAN that automatically adjusts speed and temperature, it has absolutely no competition in the market. The Teleios Grande G5 is equipped with the latest print head which provides high resolution of 600dpi with true grey scale. Drawer-style ink container enables refilling of inks while printing without staining your hands. Latest version print head with 1,152 nozzles per colour and 19.5cm printing band which enables printing at a speed of up to 190m²/hr. Touch panel for easy handling of precise work. The workstation stand for rip s/w enables simple and concentrated operation. Dgen’s unique textile feeding system allows direct printing on most of woven fabrics like flag, display material. High speed heat-fixation and curing of disperse dye and pigment ink. Automatically controls speed and temperature 80~220°C and can handle 80~100 linear m/ hr. 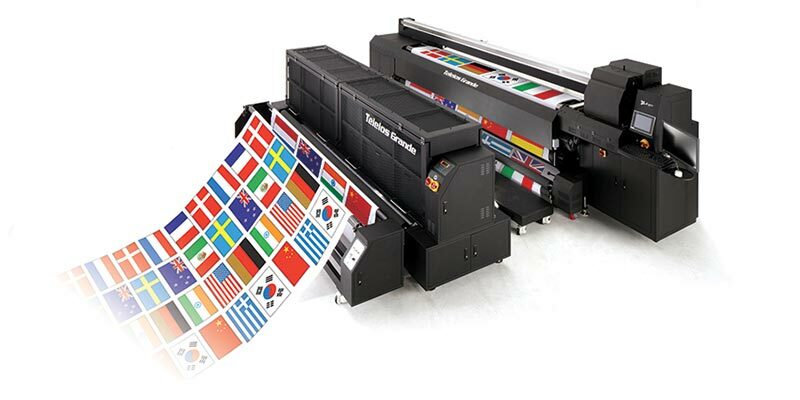 Maximum Printing width: 3,300 mm. Printing Method : Piezo inkjet (Ricoh GEN5). Maximum Resolution : 1200 dpi. Target Printing Speed – 1 pass 300 m2(3230 ft2)/h. Target Printing Speed – 2 pass 185 m2(1992 ft2)/h. Target Printing Speed – 4 pass 98 m2(1055 ft2)/h. Target Printing Speed – 6 pass 60 m2(646 ft2)/h. For a quote on Dgen textile printers please send us your contact details and we will get in touch with you soon.